I am sure you feel the same way with me that when it comes to Dengue you will do everything to protect your family. With the constant downpour of rain, as mothers, we need to more resilient with our surroundings and make sure we protect our family in and outside the house. (Left to Right) Jaime Felix, Tart Carlos, Amy Perez, Ogie Diaz and Mamane! We are nearing the 100,000 mark of Dengue cases in the Philippines and that is truly alarming. I have always believed that prevention is better than cure when it comes to my princess, bossing and hubhub. ATC Healthcare has developed a range of products that can effectively as well as safely combat the spread of dengue among Filipinos and their homes making them your most trusted ally in health. 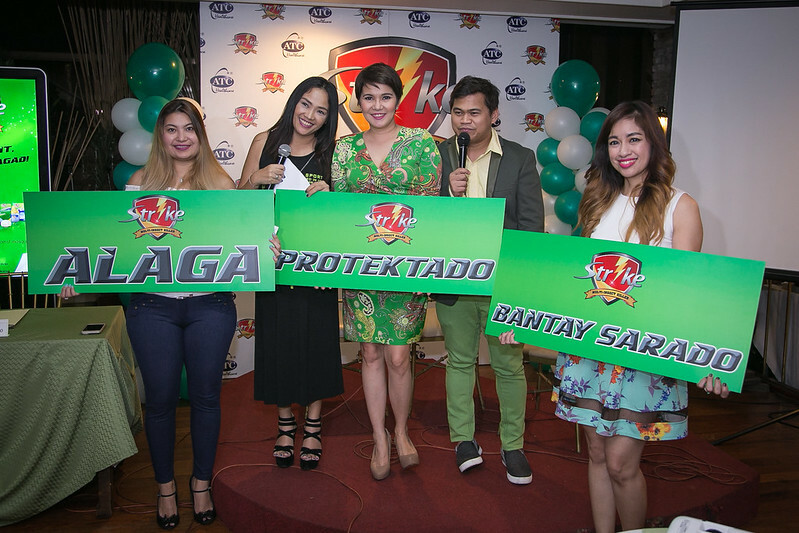 Recently, ATC Healthcare launched the campaign “Depensa Laban sa Dengue” with Mrs. Amy Perez-Castillo as its brand advocate. 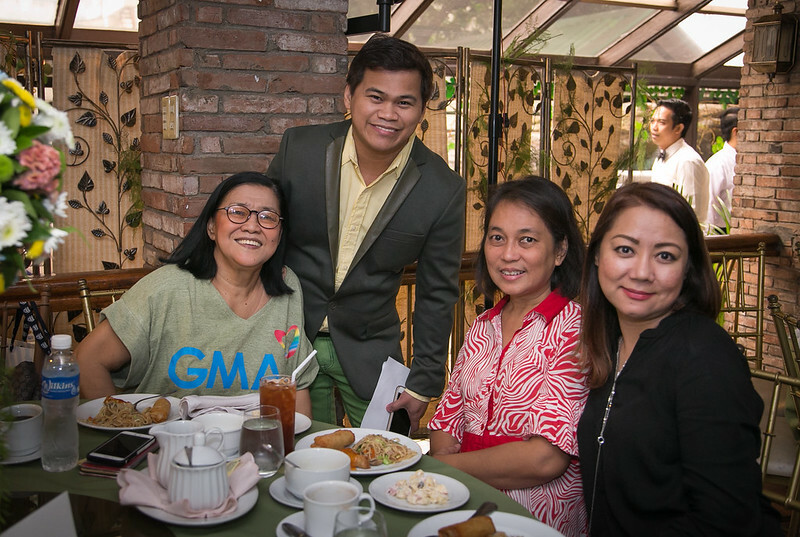 The affair was held at Annabel’s Restaurant Tomas Morato Avenue Quezon City branch on October 26, 2015. She shared helpful tips on how to protect your family from dengue and suggested the use of multiple lines of defenses that include Strike Multi-Insect killer Spray, Strike Coil, Strike Liquid Repellant, Strike Mat and Strike Patch. Mr. Louie Albert, Ms. Amy Perez and Mr. Derick Wong after the contract signing. ATC Healthcare’s President/CEO Mr. Derick Wong, and Marketing Manager Mr. Louie Albert welcomed guest bloggers and prominent media personalities who joined the launch. 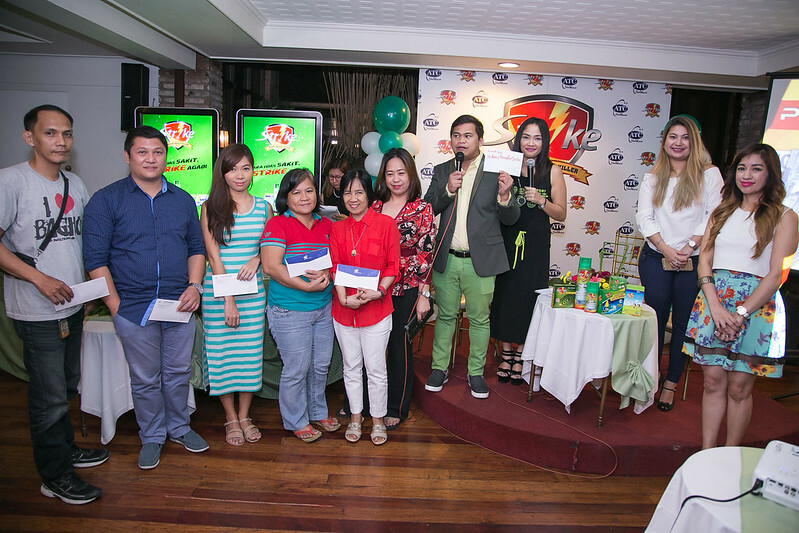 Press and Bloggers were treated to a raffle of cash prizes and iPhones! The event was hosted by showbiz comedian-artists, Mr. Ogie Diaz and Ms. Tart Carlos. 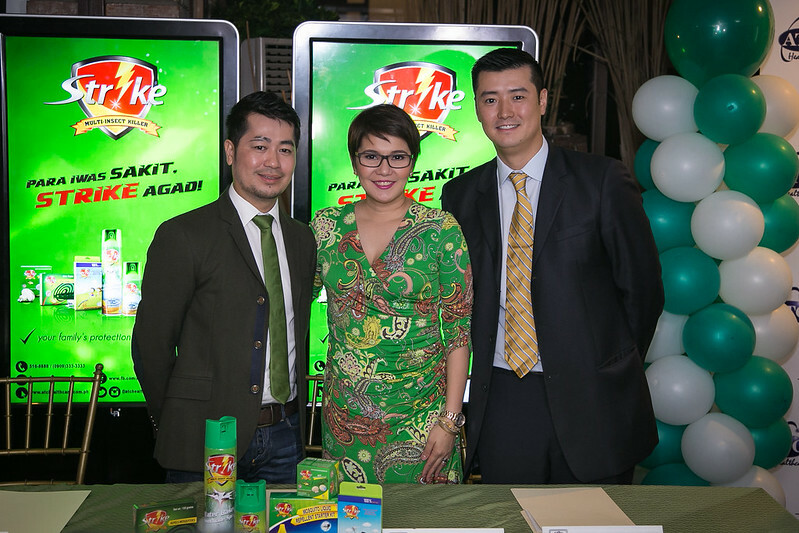 Yours truly was invited to share with Ogie and Tart, tips on how to prevent the spread of Dengue along with co-mommy blogger Jaimie of blog The Mermaid In Stilettos. During our interview session with the very funny as well as entertaining Mr. Ogie Diaz and Ms. Tart Carlos. With the help of Strike, we can battle and prevent Dengue! Strike is a fast-acting multi-insect killer that has a water-based formula which effectively kills mosquitoes and other insects. It has lower toxicity as compared to the leading brand, thus, it is safe for people, pets and plants. 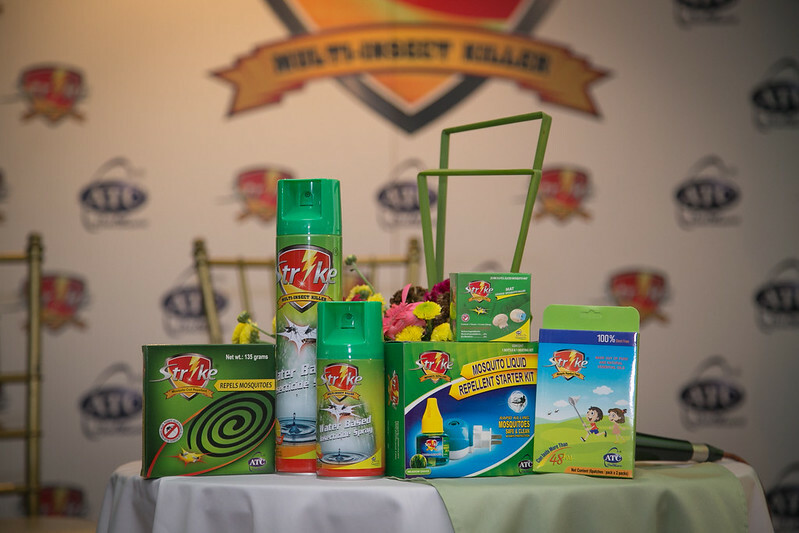 Strike is also environment-friendly unlike other oil-based insect killers and it contains no Chlorofluorocarbon (CFC). It leaves to stain on the surfaces of your home and does not release disturbing odors. Thank you ATC Healthcare for allowing me to share my tips on how to prevent Dengue in the family. 1. Keep your surroundings clean and make sure that there is no stagnant water (which is a breeding ground for mosquitoes) laying around especially during this rainy season. 2. Avoid wearing dark colors. Yes, those pests are attracted to dark clothing and will be on you, in no time. 3. At night, I use the Strike Electric Mat to keep those pests away while my family rests ensuring a safe and sound sleeping area. Strike is available at Savemore, SM Supermarkets, SM Hypermarkets, and other leading supermarkets nationwide. Para iwas dengue, Strike agad! 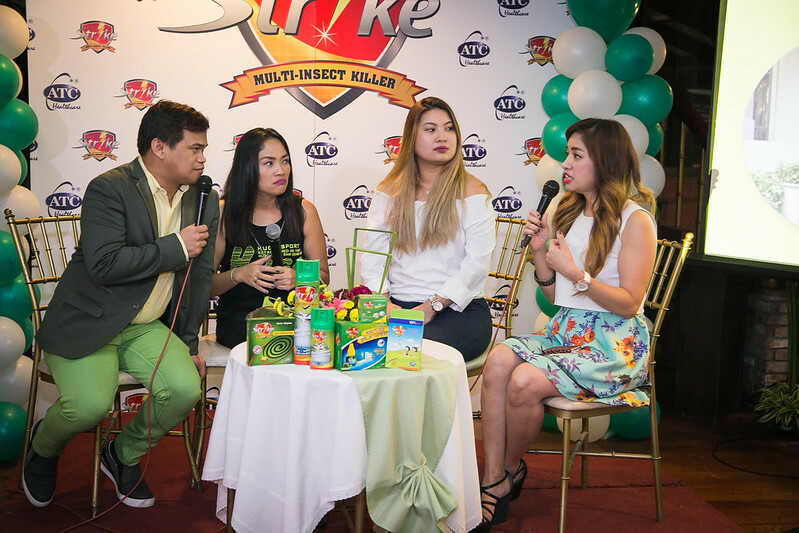 Strike Multi-Insect Killer Spray is being marketed at P136.75 for the 300ml and P258.75 for the 600ml cans, Strike Coil is P15.00 per box, Strike Liquid Repellant 248.75 for the Starter Kit, Strike Mat at P57.75 also as a Starter Pack, and Strike Patch P375.75 per Box of 10s (suggested retail price). Also please check ATC Healthcare's other products here. I just had a niece na nagkaron ng dengue. Prevention really is the best thing to do. Will definitely do check out Strike! I love the mats! Definitely my favorite. Same use like the katol but better scent and it is safe. Try ko nga yang strike sis next time, kakaparanoid na lamok eh. You look amazing on this event! I haven't tried Strike yet pero mukhang sa pangalan palang, talaga maiistrike ang kahit anong insekto dito. lol! Awww salamat sis! Tama ka dyan! this is a very timely event since there's an alarming outbreak of dengue around. Ang galing naman,will try this. It is very important for the family to have this in our home for our protection from Dengue and other pests. Thank you for sharing. this is really impt now w dengue everywhere! Dengue is scary. All we can do really as mommies is keep our families safe and protected all the time. Yes it is, kaya need natin mag Strike! This looks like fun lalo na si Ogie D ang host. Thanks for the useful tips! Naiinis ako na may lumilipad na lamok sa bahay so Strike will be definitely a big help. Naku super sis! He is sooooo mabait pati. Sakto bibili dapat kami ng liquid repellent kit ulit, di ko mahanap natapon ata, we were using a different brand, I don't remember how much it was pero kung malaki difference, nasa 300 plus ata yun, I'll check out Strike. Grabe lamok ngayon, nakakalusot kahit sobrang ingat sa pagbukas bukas ng pinto. my bro and sis were dengue victims, some of the patients during their hospital days died. we really need effective and safe insect killer like strike. How does an electric mat look like? Hindi ba delikado for kids? Hindi May, totally safe. You plug it into an outlet, tapos yung mat mismo na maliit nasa loob. Dedmakels mga anak ko sa kanya kase mukha cyang charger plug na walang cord lol. What is an electric mat? Is it effective? I'm super curious kasi naglalabasan na naman ang mosquitoes sa amin grr! Dengue is really something to be scared of. I hope our family never has to deal with it. Super kakatakot ng Dengue! Sana may vaccine na.